2,000-Year-Old Tattoo Tool Found in a Washington Storage Closet « Adafruit Industries – Makers, hackers, artists, designers and engineers! 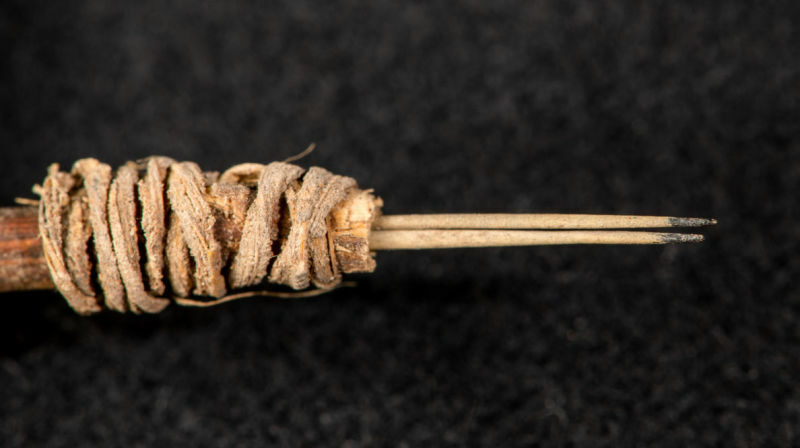 A 2,000-year-old wooden implement with black-tipped cactus spines is now the oldest example of a tattoo tool in western North America, a discovery that’s shedding important new light on this ancient practice. Incredibly, the relic might have never been discovered had it not been for an inventory check. The tool, discovered by anthropology Ph.D. candidate Andrew Gillreath‑Brown from Washington State University, dates back to the Ancestral Pueblo people of southeast Utah, who lived 2,000 years ago during the Basketmaker II period (around 500 BCE to 500 CE). The 3.5-inch-long device, created over 1,400 years prior to the arrival of European colonists, was made from a sumac tree stem, yucca leaf strips, and the sharp spines of a prickly pear cactus, the tips of which were stained in black. The discovery, chronicled in a new study published this week in the Journal of Archaeological Science: Reports, is more than a thousand years older than other early evidence for tattooing in western North America.